BITSS supports Open Policy Analysis (OPA), an approach to policy analysis wherein data, code, materials, and clear accounts of methodological decisions are made freely available to facilitate collaboration, discussion, and reuse. Senator Elizabeth Warren declared her 2020 presidential bid on a platform based on policies to rebuild the American middle-class. A key part of her campaign will be a progressive wealth tax on the net worth of American households, including a 2% tax on net worth above $50 million, and an additional 1% tax on net worth above $1 billion. UC Berkeley economists Emmanuel Saez and Gabriel Zucman—the researchers whose analysis forms the basis of the plan—estimate that "75,000 American households (less than 0.1%) would be liable for the wealth tax and that the tax would raise around $2.75 trillion" in the first ten years of its implementation. Such sweeping policy ideas are regularly the subject of contentious debates, such as those around raising the minimum wage, taxing carbon, or instituting universal healthcare. Arguments in such debates are often split along ideological lines, with opposing sides citing diverging estimates, assumptions, and data. Further, some arguments are too general to be useful, like the critique by the Economist that described Saez and Zucman's analysis as based on assumptions that are "probably too rosy." Disclosing in full the assumptions, data, and methods behind each analysis can reduce the risk of conflating ideology with facts, and allow others to critically assess the merits of the alternative. That is why Saez and Zucman teamed up with the Berkeley Initiative for Transparency in the Social Sciences (BITSS) to "open up" their analysis, publicly sharing all their data and methods to make it possible for anyone to assess its validity and credibility. Having worked with researchers in academia to tackle the credibility crisis in the social sciences by improving the transparency and reproducibility of research, BITSS is now looking to apply relevant lessons to policy analysis. 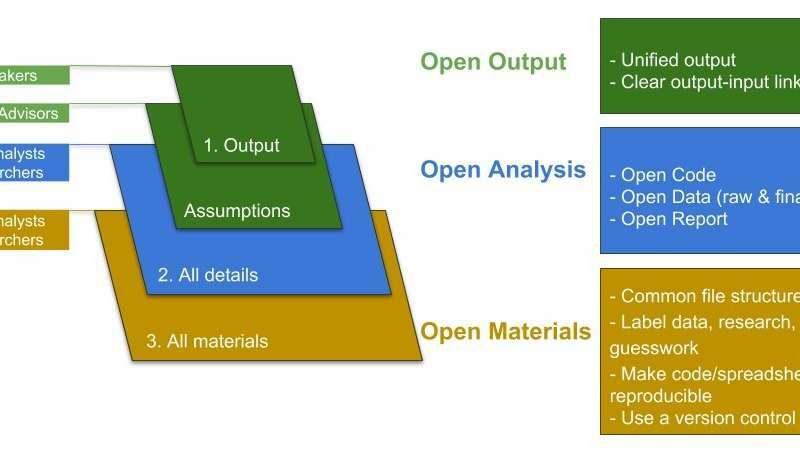 The approach is called Open Policy Analysis (OPA), where data, code, materials, and clear accounts of methodological decisions are made freely available to facilitate collaboration, discussion, and reuse. BITSS Project Scientist Fernando Hoces de la Guardia, who leads the OPA initiative, argues that it can help policy debates transcend ideological differences, and instead focus on the technical merit of the proposed policy. Applying OPA to Saez and Zucman's analysis, the team developed an interactive plot to simulate the results of the analysis for different parameters (developed with the help of Sara Stoudt, a Berkeley Statistics Ph.D. student and BIDS Fellow); an "open policy report"" that details all data, code, and assumptions behind the analysis; and an open online repository that stores all materials necessary to reproduce the analysis from scratch. Using the interactive plot, readers can alter the number of tax brackets, apply different rates to each, and even adjust the estimated tax evasion rate, observing how each alteration affects the tax burden, tax base and projected revenue. The open policy report then goes a step further, and details how Saez and Zucman constructed each parameter, spelling out each assumption behind the proposal, including their estimated tax evasion rate, one of the proposal's most contentious elements. Finally, readers can download all materials from the online repository, and recreate the analysis in full with minimal effort. This approach is a radical departure from the way traditional policy reports are written. In such reports, it is often difficult to understand what decisions were made when models were constructed, why certain inputs were used rather than others, or even which data were used. "Our analysis is fully transparent and reproducible, and we would love to see opposing arguments laid out in a similar way," say Saez and Zucman. "To truly achieve the ideals of evidence-based policy, both policymakers and policy analysts need to be clear about what evidence they include in their reasoning, and how." Analysts representing different policy areas and political inclinations have already endorsed the OPA approach. The 2018 BITSS Annual Meeting, which gathered leaders in the research transparency movement, hosted a panel of policy analysts including Hilary Hoynes of UC Berkeley, Matt Jensen of the American Enterprise Institute, Kevin Perese of the US Congressional Budget Office, and Josh Rosenberg of GiveWell. Moderated by Hoces de la Guardia, the panel discussed various challenges to the rigor and credibility of policy analysis, and agreed that greater transparency and reproducibility may indeed transform the discipline. I've been wishing for years to see a move toward more evidence and science based policy making. Granted this is an area that probably can't be done 100% scientifically, but it makes sense to apply science as much as possible to improve accuracy. Too often, politicians seem to pull ideas from their posteriors and insist it is a great idea based on irrelevant evidence, fallacious arguments, and doctrinal purity. Others seem to rely on a more rigorous approach but we're rarely let in on just what that approach is. Hopefully this will help nudge debate toward actual argumentation rather than the current spin doctored shouting match and high school level cut down contest we're currently stuck with. does the model include the effect of selling assets into a now down market . And the likelihood that gov. will just get gready. ? Well NY, a high tax state, has just lost 2.3 Billion in taxes because of federal tax changes making it advantageous to move to other states. A implement a federal net wealth and the rich will move to other countries and take their jobs with them. Whereas Trump reduced regulations and some corporate taxes and created an mini employment boom . It has been estimated that you could have a 100% income tax on the rich here in the US and only increase federal tax income by $800 Billion. This in not a lot of money in comparison federal deficits. A few years of the and there would be no jobs in the US. It is an often overlooked (forgotten) part of taxing the wealthy, which is: our system is an INCOME tax. You don't get taxed on the money you've already been taxed for. Well she is proposing a Wealth tax. 50 years @ 2% and you will be in poverty like the rest of the people. This is all part of the plan to destroy all wealth in the US and turn us into a 3rd world country. If some idiot inherited $100 million and passively invested it in the stock market, he'd earn 7% a year over the long term. Subtract 2% for inflation and another 2% for this wealth tax, he would gross $5 million a year, perhaps $4 million after capital gains tax, and he would maintain that standard of living for the rest of his life without having worked a single day. It would take a special kind of idiot to lose this money, like the kind that "invests" money by stuffing it in a mattress. You're not a mattress-stuffer, are you, MR166? You sound like one.